Did you know that there is a special day earmarked for worldwide celebration and promotion of diverse languages and multiculturalism? International Mother Language Day was created by UNESCO (United Nations Educational, Scientific and Cultural Organization) and is held annually on February 21st. Made official in 2008 by the United Nations General Assembly, the chosen date marks an event in 1952 when students were shot and killed in present-day Bangladesh while demonstrating for the recognition of their national language, Bangla. Currently gathering momentum around the world, IMLD is the subject of many world-wide activities as well as a variety of great features from Multicultural Kid Bloggers whose posts can be found here at the special Facebook Page below. Along with being a great way to celebrate world cultures, IMLD is an excellent opportunity to focus on world languages and to use music and the arts as a way to encourage diversity and multiculturalism, especially with young children. Although learning a new language can seem difficult at first, using music and games is a great way to connect with new sounds, words and phrases. In the process of singing or simple music activities or games, kids (or people of any age) begin to make sense of phrases and words and can build their competency and enjoyment of speaking another language. Essentially this is an “I’m gonna tell on you” song. Here’s what the words you’re hearing mean. 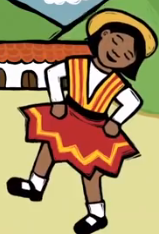 “Puka” is the color red and a pollera or polleracha (little pollera) is a traditional skirt. “Hey, girl in the little red skirt”. It also talks about a corn field – and the word “sara” means corn. The song then says “I am going to tell your mom and your dad” and you can easily hear the words “Mamayki” (your mom) and Taitayki (your dad). 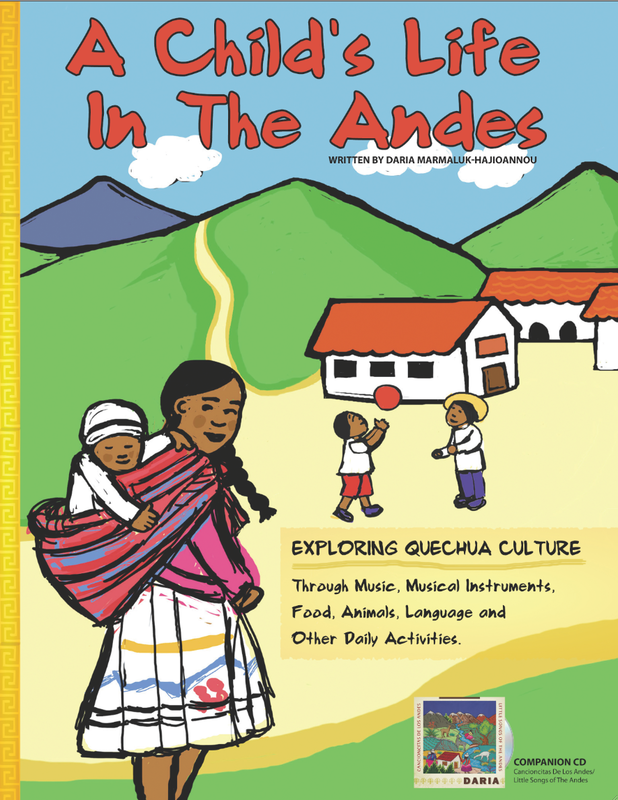 Although it takes more then one song or game to learn a new language, it’s a great start and a fun way to build bridges between cultures – especially in languages like Quechua that may be in danger of being left behind or lost. 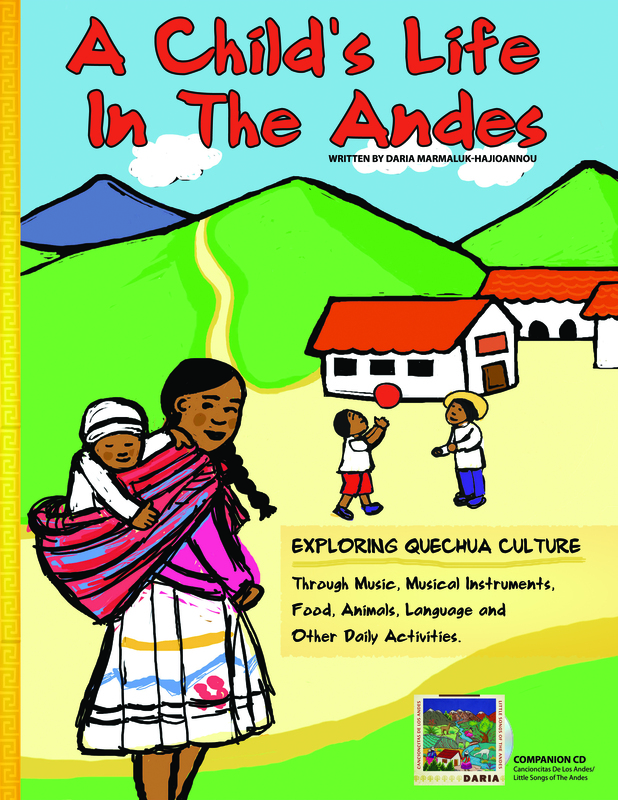 Want to learn more about the Quechua culture? Check out the E-book and companion CD below. And if you are a classroom or homeschooler with limited budgets, please contact us as we would be happy to get you a free copy for your use. To get a free copy, e-mail dariamusic at yahoo dot com and put “Free E-book” in the subject line. Wishing everyone a happy International Mother Language Day! 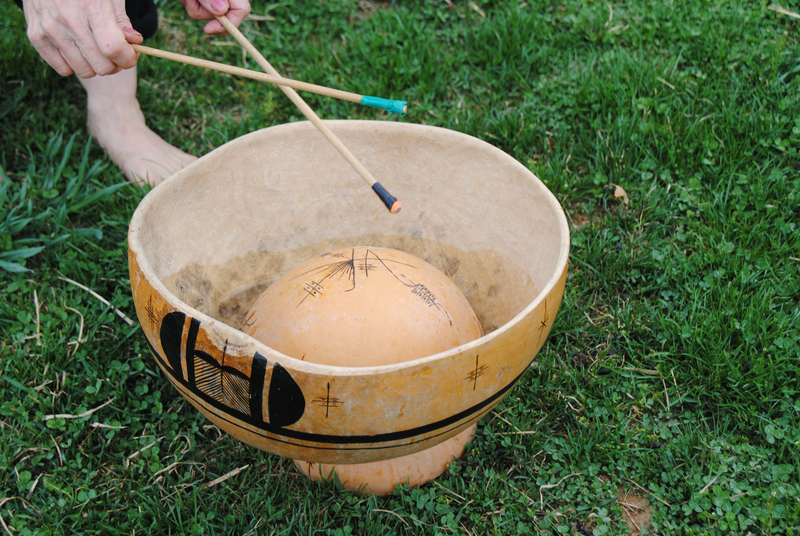 Although it’s a truly unique and amazing–sounding instrument, there’s very little information available about the history of gourd water drums. It’s clear that they are used in certain areas in Africa and that they show up in Mayan archives as “bubulek” water drums. In present day Mexico they are called jicara de agua and their history can also be traced to the Yaqui and Yoeme Indigenous people who called these floating gourd water drums, baa wehai. What, exactly is a gourd water drum? Generally made from 3 sturdy pieces of dried gourds, a small ring holds the larger “gourd bowl”, up-side-down in place. That larger gourd is filled with water. The smaller gourd is placed right-side-up, gently on the water’s surface where it is hit with a stick or tapped with fingers, palms or knuckles to create the unique, deep and resonant sound associated with this instrument. While checking out LA born drummer and percussionist, Christopher Garcia, we found some really great information on the Yaqui and Yoeme roots of floating gourd water drums. Although several musicologists identify this drum as part of the Yaqui Deer Dance (Mazotiwua), Garcia explains how a special beater is used called a baa jiponia, made from a stick wrapped in a corn husk. He also shares some great pictures and basic information on a related instrument, called hirukiam which consist of a gourd facing down and a rasp laid across it, then scraped. The result is a “natural speaker” and another really unique sound creation. Links to Christopher Garcia’s music and website can be found below. 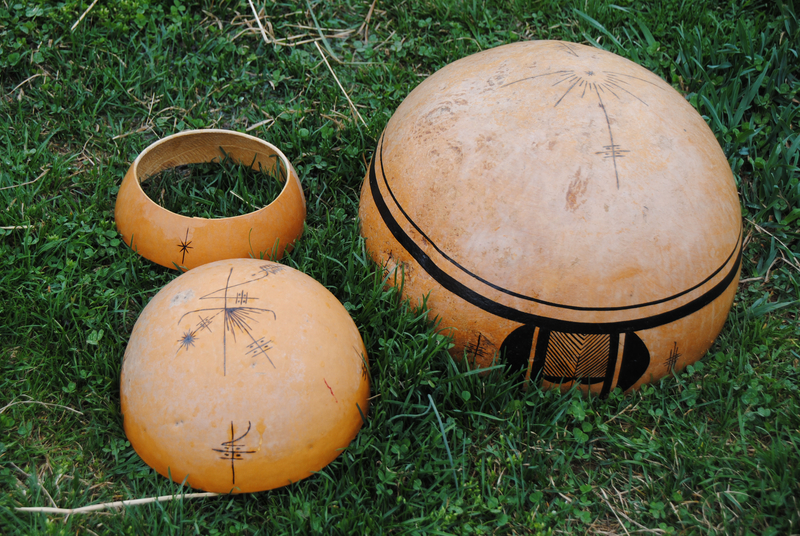 Also a wealth of information on ancient Mexican culture and musical traditions, Michael Heralda has two informative step-by-step videos that show you how to create your own gourd water drums. You’ll notice that his drums not only sound good, but are beautifully decorated. For more information on his music, instruments, stories and other resources, visit the link below. A conch shell is a beautiful thing. But who would guess that cultures all around the world would not only admire it’s beauty but also figure out that – with a few minor modifications – it becomes a completely functional, natural trumpet! Among others, there are conch trumpets heard in music from the South Pacific, Tibet, Korea and pre-Incan cultures. Archeological finds and older documents also place it in Aztec culture and ceremonies as well. Here’s a bit more about the Aztec conch shell trumpet. Pictured here is a musician called a “quiquizoani” playing the conch shell. The name is in the Nahuatl Indigenous language of Mexico and this specific image can be found on page 23 of the Aztec Codex “Magliabecchi”, currently preserved and archived at the University of Utah in the United States. One of the best sites for information on Aztec instruments, including great pictures from archeological sites and historical references is Mexicolore.com (see resources below). Their research shows that there were 7 different types of conch shells and that the largest was called the ‘quiquiztli’. As you might imagine, the shell trumpet was highly symbolic and associated with the breath of life as well as the rhythms of the sea. Similarly, it was associated with the call to prayer, marking time during the day and during the night, the moon, fertility and Ehécatl – the Aztec God of the Wind. 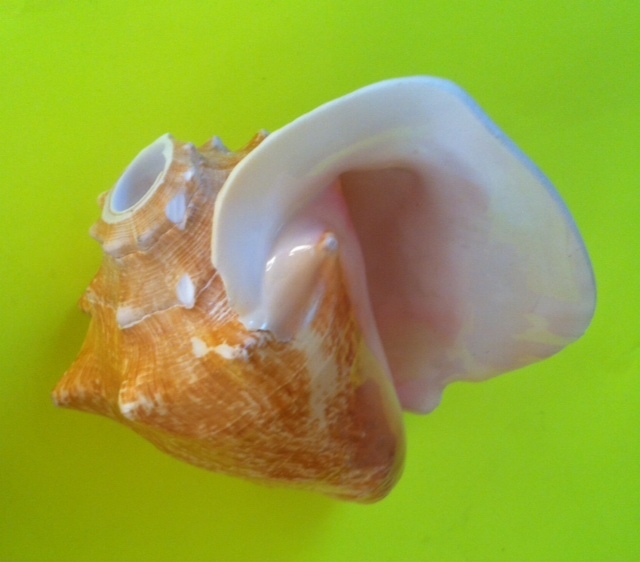 Research also shows that conch shell trumpets were used by the Aztec military in a manner similar to modern day bugles. Closer to home, conch shells are part of a unique contest in the Florida Keys. Although the tradition of blowing the conch trumpet dates back over 200 years, it was originally used mainly for maritime signaling. Recently, however, the contest is a lot more colorful with contestants that vary in age from 3 – 83 and even perform with unique outfits, hula hoops and other novelty approaches. What Does A Conch Trumpet Sound Like? Check out this short video where a young buy demonstrates how to cut the conch shell and how to practice getting the trumpet sound. Although Earth Day began in the USA in 1970, the idea of loving and caring for our planet is a universal concept. When I was growing up, I remember hearing a Native American group sing the words: “The Earth Is Our Mother, We Must Take Care of Her”. All over the globe, people express their love for “Mother Earth” through music, songs, culture and in so many other meaningful ways. 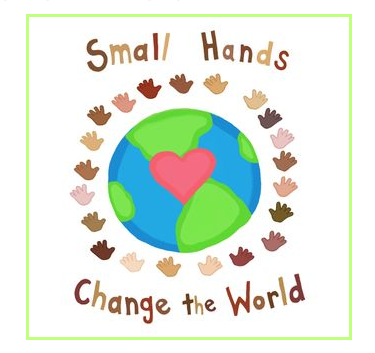 In 2004, I adapted a new version of the beautiful African-American spiritual: “He’s Got The Whole World In His Hands” and added lyrics based on a project done with elementary school students. Since that time, the song has been used in China, Singapore, South America, Scotland and in dozens of other venues across the world. This year, a wonderful bilingual blogger translated the lyrics into Spanish. The Spanish version was written by Cecilia Fencer, head and heart of Spanglish.house.com . She loves diversity and equality. Translating this spiritual to an Earth Day captured her imagination because she believes God made us responsible to take care of his creation. Zampoñas (pronounced zam pon nyas) are a series of hollow “pipes” made from hollow reeds found near lakes in the high mountains. When these reeds are cut and used one at a time, they often become simple flutes such as the quena pictured here. 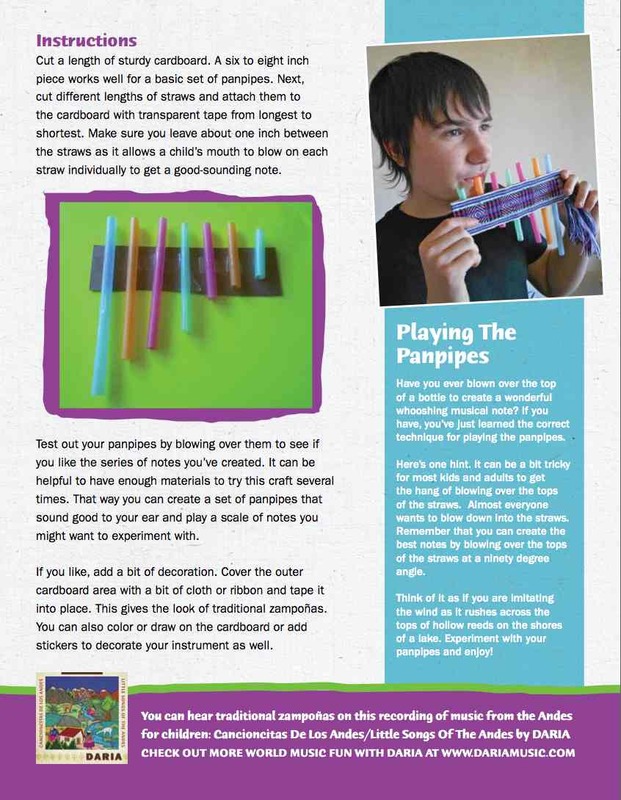 When the reeds are cut to different lengths and bound together in a flat or slightly curved arrangement, they become part of the the large family of panpipes that can be played solo or in a group. Also called siku or sikuri, many festivals feature groups of men playing together – called sikuriada – where the song is performed by alternating notes back and forth between the players while they walk. Playing the zampoñas is a bit different than many common wind instruments. Various sounds are created by blowing over the top of the reeds in the same way you might blow over an empty soda bottle to create a musical note. Although understanding all the different names of zampoñas can be complicated, here’s some basic facts. The word zampoña is Spanish. In the Native language of Aymara, panpipes are called siku or sicuri. 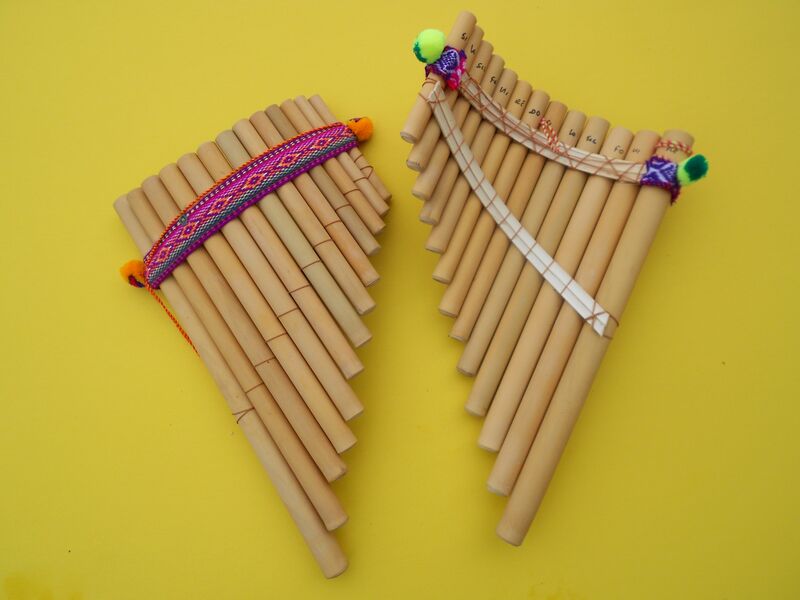 In the Native language of Quechua, panpipes are called “Antara”. 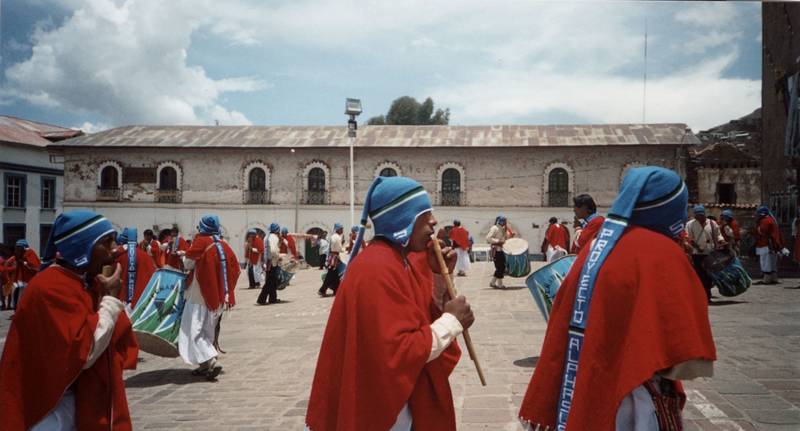 In Quechua, the family of panpipes include Ika or Chulli (or Ch’ulli) that are about the size of a fist. The next largest size are called “mallta”. One octave lower than “mallta” are the “sanka” (or zanka). And the largest – sometimes three or four feet long – are called “toyo”. Just as the names change from village to village and region to region, the manner of playing is also wonderfully unique, making this an instrument that will never cease to amaze those who wish to explore it or learn to play it. 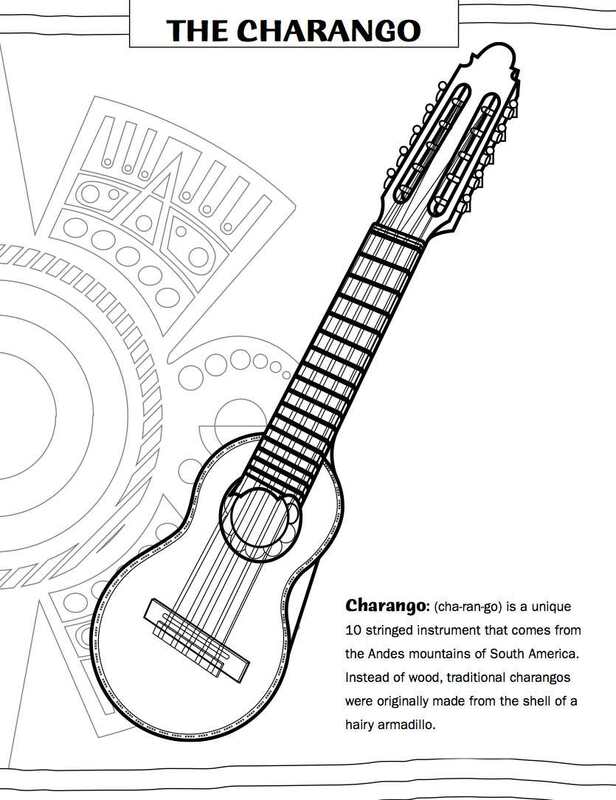 Would you like to listen to this instrument, color one or make your own version at home or in class? Check out some of the helpful links below. Can you imagine seeing a bird with a ten foot wingspan fly overhead? 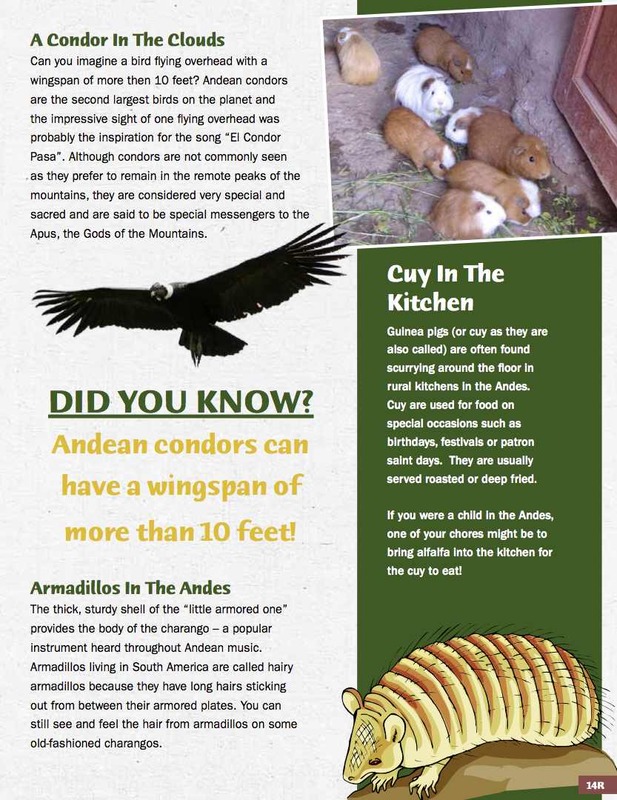 That awesome site was probably the inspiration for the song: El Cóndor Pasa which translates loosely to “The Condor Passes By” or “The Condor Flies By”. Often mistaken for a folksong, this beautiful melody was written by Peruvian composer, Daniel Alomía Robles, in 1913. And since his composition remains true to the sound of Andean folksongs and the music that dates back to Incan times, El Cóndor Pasa is often considered an anthem of the Andes. Many people in the USA recognize the song because singer/songwriter/ musician, Paul Simon, used one part of it in on his Bridge Over Troubled Water album. In the original composition, the song consists of three parts: the yarabi (first part), the fox (second part) and the huayno (last part). You can hear a version of the entire song recorded by DARIA with the band SONQO at the link below. Why would a condor inspire such awe? In Incan times, the condor (known as kuntur in the Native language of Quechua) was seen as a messenger for the Apus – the Gods of the Mountains. 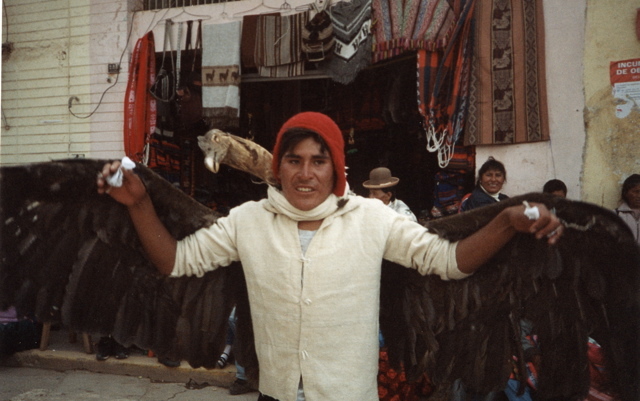 Seeing a condor was a rare but powerful experience and its feathers and likeness are part of several sacred or ceremonial dances, such as the one seen here at the Festival of the Virgin of Candelaria in Puno, Peru. 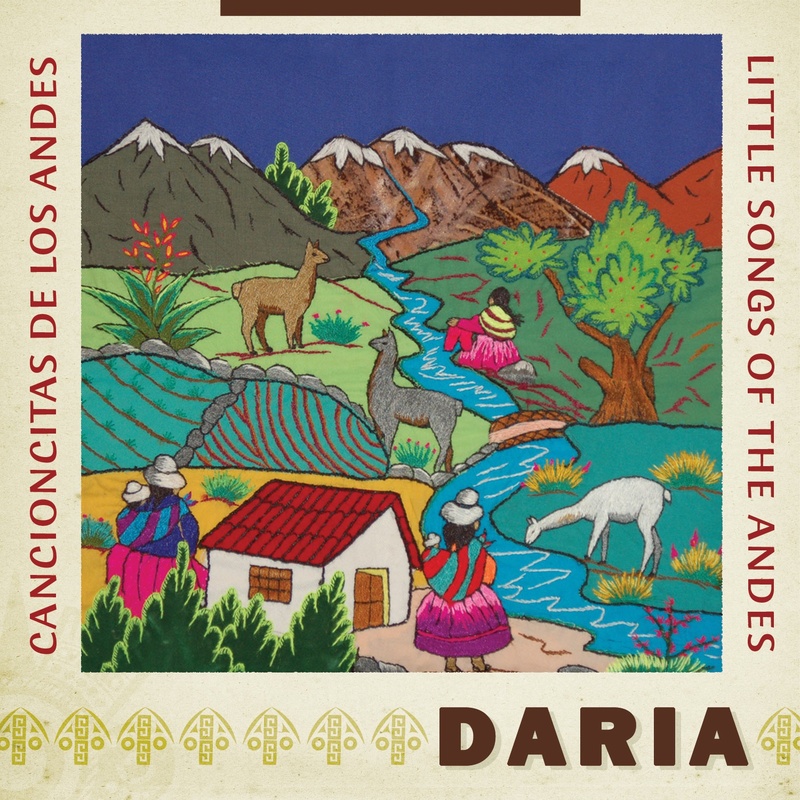 To hear a traditional version of El Cóndor Pasa and five other songs from the Andes performed with authentic instruments, check out DARIA’s new cd – Cancioncitas De Los Andes/Little Songs of the Andes. Do you want to learn more about Native American music or culture? A Native American museum is a great place to start. Across the USA, you can find various museums and cultural centers that are great ways to see, touch, hear and learn more about the Native People of your region, both from the past and in the present day. You may be surprised to learn new things about the history of your area or to find that local place names have a special meaning in the Native American tongue of your region. If you are close to Washington DC or New York city, you can visit two of the NMAI – National Museums of the American Indian. Both are exciting places to experience Native culture first-hand. Aside from an incredible facility with on-going exhibits, the main NMAI in Washington DC regularly runs classes, workshops and even online performances or seminars about topics of interest concerning Native American culture. You can find the main link to these sites below. The New York location of the NMAI was recently affected by Hurricane Sandy but just announced that it will reopen on Wednesday, November 14th and resume normal operations. A list of their classes and programs can be found below. What if you’re not close to one of these locations or want to know specific information about local tribes near your home? Start by searching the name of local tribes online to see if a museum or cultural center exists or find a contact on the site powwow.com. Within a short time, you should be able to find accurate and up to date information about what is happening in your area in regard to Native Culture. One note about names. Remember that there are commonly used names for tribes that are not the same as the ones used by the tribes themselves. For instance, although the Iroquois Museum uses the term “Iroquois”, the teaching resources utilize their preferred name of Haudenosaunee, meaning “People of the Longhouse”. Can’t visit a museum in person? Check out the websites below for some great experiences. For instance, the NMAI in New York has a special 5 year long exhibit called the Circle of Dance. If you visit the main page, you can see a glorious slide show of Native Dance regalia from all over the world. At the main NMAI site, you can discover a host of teaching materials or even do an online search of collections. Some facilities; such as the Iroquois museum, also offer resources for tracing genealogy. The Museum of Inuit art offers audio and video tours. Many sites have bookstores online where you can purchase accurate material on Native history and traditions as well. Images seen here are from the Circle of Dance exhibit as listed below. Have you ever seen a Native American rattle made from the shell of a turtle? It’s used by a variety of tribes and it’s quiet sound is perfect for accompanying singing or special ceremonies. These turtle rattles were made by craftsman, Ron Poole who actually started making drum beaters before he created these unique instruments. His story and comments below will tell you more about his background as a craftsperson as well as what it takes to make a traditional rattle such as the ones pictured here. “As a young boy, I remember watching my grandfather and father create pieces of art out of materials found in nature. I was amazed at their creations and hoped I too someday would follow in their footsteps. It was not until a trip out west that the spark was lit and I began to infuse native imagery into my own work. My carving is an effort to further the family tradition and explore the connection between cultures, myth and music. I started out making Native inspired drum sticks also referred to as beaters which led to learning how to make Turtle Rattles. I began making the beaters after being gifted from my girlfriend a hand drum and beater making kit from Noc Bay Trading Company. They included a small black and white instruction on how to create a beater from a wooden dowel, piece of deer hide, artificial sinew, yarn and glue. When I began making my first beater, I looked at the dowel and decided that I wanted to find wood from the forest behind my home. I enjoy trying to keep the beaters as close to their natural state as possible often leaving the bark on the beater. When making the turtle rattles I use a power hand drill to drill out the holes and attach the leather using a thick needle and artificial sinew. 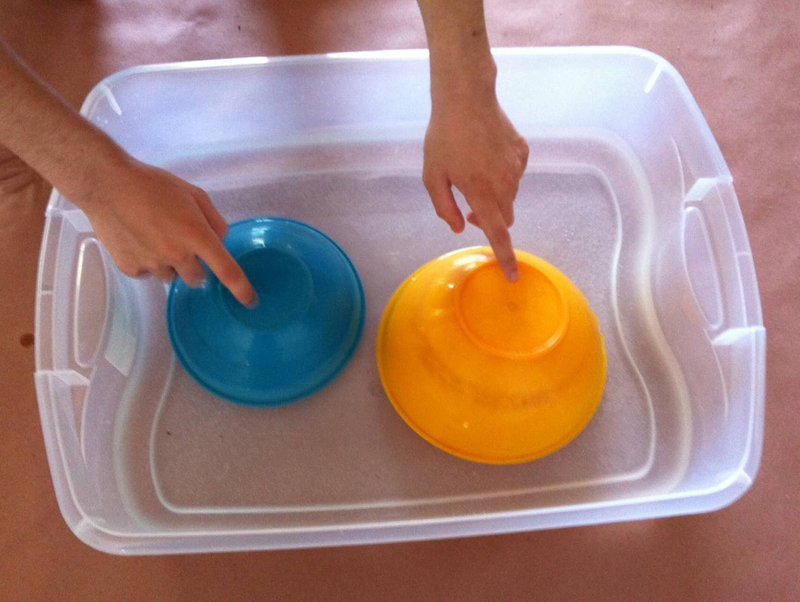 I fill the turtle rattle with sea shells that creates the percussion. I handburn the rattles with a Nisburner hand burner. Hand burning; called pyrography, is one of my favorite parts of creating art. Burning yourself can be a bit painful but kind of comes with the territory.